The Qwiic OpenLog's current draw is about 20mA to 23mA when writing to a microSD. Depending on the size of the microSD card and its manufacturer, the active current draw can vary when the OpenLog is writing to the memory card. The Qwiic Open Log implements a register map type set up if you'd like to create your own library. 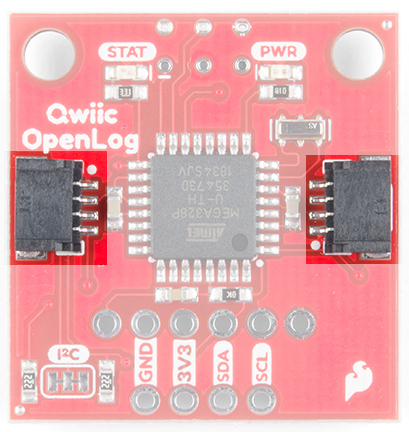 Like its predecessor, the Qwiic OpenLog runs off of an onboard ATmega328, running at 16MHz thanks to the onboard crystal. 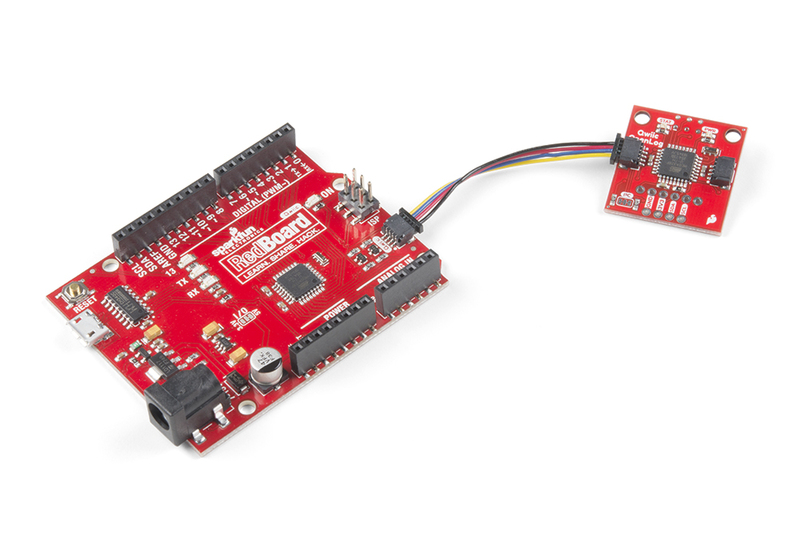 The ATmega328 has the Optiboot bootloader loaded on it, which allows the OpenLog to be compatible with the "SparkFun Redboard" board setting in the Arduino IDE. The brain of the Qwiic OpenLog. The primary interface with the Qwiic OpenLog are the Qwiic connectors on either side of the board. If you aren't familiar with the Qwiic system, you are in for a treat! The Qwiic system utilizes I2C protocol to allow multiple “slave” digital integrated circuits (“chips”) to communicate with one or more “master” chips with a mere two wires. Check out all the benefits of the Qwiic System here. While the Qwiic OpenLog retains the broken out FTDI header pins, they pins are used specifically for reprogramming the firmware. All logging communication happens through the Qwiic lines and associated broken out pins. There are also six SPI test points broken out on the opposite side of the board. You can also use these to reprogram the bootloader on the ATmega328. The final interface for communicating with the Qwiic OpenLog is the microSD card itself. To communicate, the microSD card requires SPI pins. Not only is this where the data is stored by the OpenLog, but you can also update the OpenLog's configuration via the config.txt file on the microSD card. There are two LEDs on the OpenLog to help you with troubleshooting. STAT - This green LED is connected to Arduino D13 (Serial Clock Line/ ATmega328 PB5). This LED only blinks when the SPI interface is active. You will see it flash when the OpenLog records data to the microSD card. PWR - This red indicator LED is attached to Arduino D5 (ATmega328 PD5) and lights when the board is active and functioning. 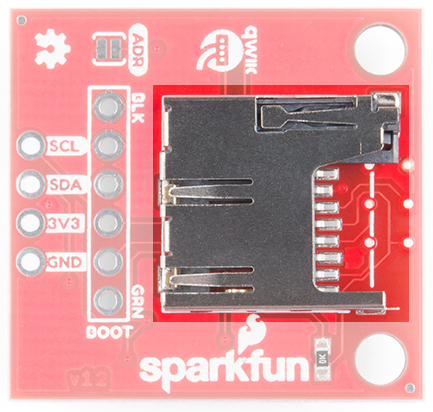 If you've purchased the SparkFun RedBoard Qwiic, hardware hookup is as simple as plugging in your Qwiic cable! 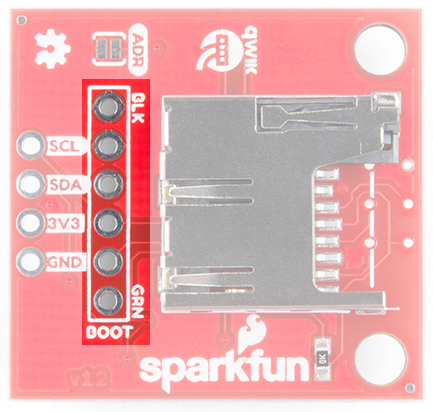 If, however, you are using an older SparkFun RedBoard, you'll need an assembled Qwiic Shield, so if you haven't done that yet, now would be the time to head on over to that tutorial. 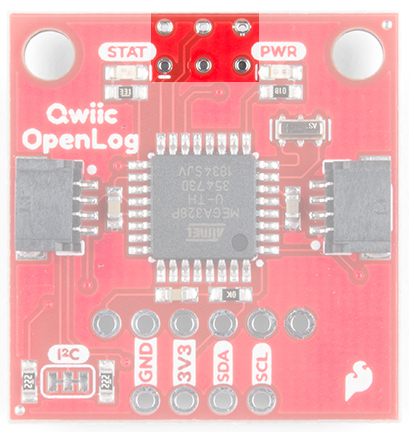 There are eleven examples in the Qwiic OpenLog Arduino Library that can be used when connected to a Qwiic OpenLog. These Arduino functions replace the serial command communication that occurred on the previous version of the OpenLog. These example files are named such that their functions should be self-explanatory, but in case you want more information, see the descriptions below. The easiest way to install the library is by searching SparkFun Qwiic OpenLog is within the Arduino library manager. To manually install, head on over to the GitHub Page or feel free to download the library here! Example1_WritingLog -- This example shows how to record various text and variables to Qwiic OpenLog. Example2_AppendFile -- Arduino sketch showing how to append text to the end of File. If File does not exist when this function is called, the file will be created. Example3_CreateFile -- This example shows how to create a new file named File in the current directory. Standard 8.3 filenames are supported. For example, "87654321.123" is acceptable, while "987654321.123" is not. Example4_ReadFileSize -- This example shows how to record some strings to a default log, check the size of a given file name, and if the given file doesn't exist, say so. Example6_MakeDirectory -- This example shows how to create a directory, move into that directory called MONDAY, create a sub directory within MONDAY called LOGS, and create and write to a file inside MONDAY. Example7_ReadDirectoryContents -- This example shows how to read the files in a given directory. You can use wildcards if desired. This is handy for listing a certain type of file such as .LOG or LOG01.TXT. Example8_RemoveDirectory -- This example shows how to create a directory, create some files there, delete a specific file, delete *.TXT, and remove the directory we created. Example9_ReadVersion -- This example shows how to read the firmware version of Qwiic OpenLog. Example10_CheckStatus -- This example shows how to read the status byte of the OpenLog. Example11_ChangeAddress -- This example shows how to change the I2C address of the Qwiic OpenLog. It's easy to change the I2C address. If you forget what the address is you can use the I2CScan Example to re-discover it. You can also close the ADR jumper on the board. This will force the I2C address to 0x29 regardless of any other setting or command. 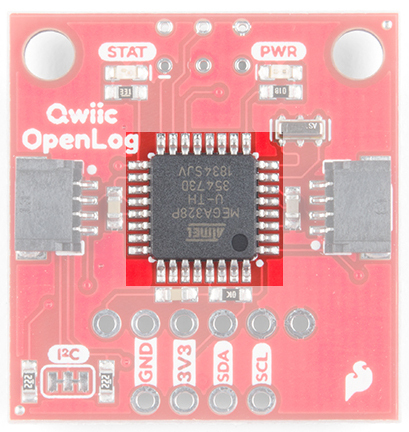 The Qwiic OpenLog has two primary pieces of software on board: the bootloader and the firmware. 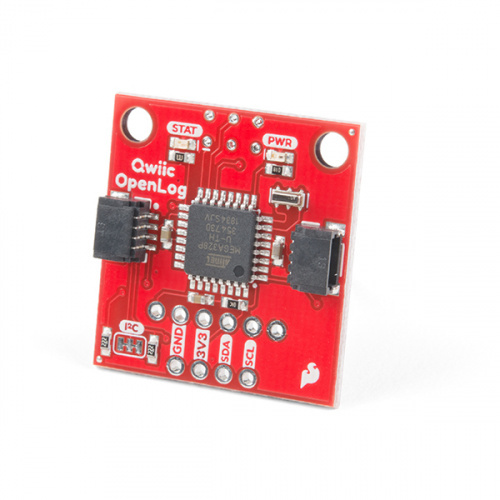 You can treat the Qwiic OpenLog just like a SparkFun Redboard when uploading example code or new firmware to the board. Once you have the firmware downloaded, install the libraries into Arduino. If you are unsure how to manually install the libraries in the IDE, please refer to the link above. If you haven't yet, connect your OpenLog to the computer via an FTDI board. Please double check the example circuit if you are not sure how to do this properly. You will likely need to solder headers to the FTDI pins in order to access them. See our soldering tutorial if you need help here. Open the OpenLog sketch you would like to upload under Tools>Board menu, select the "Arduino Redboard", and select the proper COM port for your FTDI board under Tools>Port. That's it! Your OpenLog is now programmed with new firmware. The configuration file is not as relevant with the updated Qwiic OpenLog as it was with its predecessor. When you open the config file, you will see the I2C address, escape character, the number of escape characters, and the mode. You can edit the I2C address and the mode, but ignore the escape character and number of escape characters. 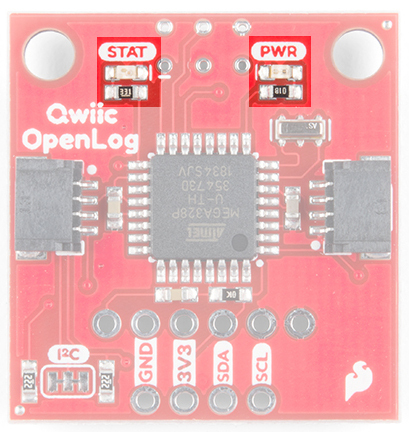 There are several different options to check if you are having issues with your Qwiic OpenLog. If you are using the default OpenLog.ino example, OpenLog will only support two subdirectories. You will need to change FOLDER_TRACK_DEPTH from 2 to the number of subdirectories you need to support. Once you've done this, recompile the code, and upload the modified firmware. There are many different types of card manufacturers, relabeled cards, card sizes, and card classes, and they may not all work properly. We typically use a 16GB class 10 microSD card, which works well at 9600bps. If you are using an older card or anything less than class 6, you may want to try upgrading your SD card. If you are still having issues with your Qwiic OpenLog, please check out the current and closed issues on our GitHub repository here. There is a large community working with the OpenLog, so chances are that someone has found a fix for the problem you are seeing. Now that you've successfully logged data with your Qwiic OpenLog, you can set up remote projects and monitor all the possible data coming in. Consider creating your own Citizen Science project, or even a pet tracker to see what Fluffy does when out and about!